The Middle East Public Relations Association (MEPRA) hosted the fourth Leadership Majlis today, the year’s major communications conference in Abu Dhabi. The 2018 edition brought together almost 200 industry professionals from more than 40 organisations, to uncover the industry’s biggest challenges trends and opportunities. Speakers included senior leaders from The National Media Council, PRWeek, Facebook, Mubadala, Etihad Airways, Marriott International, Arthur W. Page Society, The UAE World Energy Congress, CARMA and United Eastern Medical Services. The morning conference covered the theme ‘Power Forward’, highlighting the power of PR through a mix of presentations, panel discussions and case studies, including; countering fake news in the UAE; CEO activism; PR as the most powerful marketing discipline; PR professionals at the leadership table; and how the brand defines communications. As the platinum headline partner, the National Media Council opened the conference with NMC Director General His Excellency Mansour Al Mansouri, through a Q&A moderated by Founder & CEO of ASDA’A Burson-Marsteller, Sunil John. The session covered NMC’s mission and role in consolidating the UAE’s status and media presence. His Excellency also announced the opening of a foreign correspondents club later this year to ensure on-going conversations continue, seven days a week, as part of UAE’s commitment to open communications. 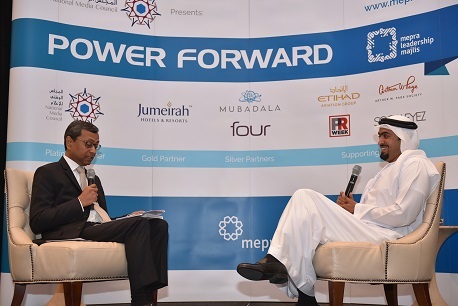 The National Media Council and its crucial role in the positioning of the UAE: His Excellency Mansour Al Mansouri, Director General, National Media Council interviewed by Sunil John, Founder & CEO of ASDA’A Burson-Marsteller. The Power of Truth: Countering fake news in the UAE: Nashwa Aly, Head of Public Policy, Facebook. The Power of our Industry: How public relations can be the most powerful marketing discipline in the future: Danny Rogers, Editor-in-Chief, PRWeek. The Power of CEO Activism: How companies around the world are wrestling with demands to take a position on controversial social issues: Case study presentation by Peter Debreceny, International Vice President for the Arthur W. Page Society and former VP of Corporate Relations at Allstate Insurance Company (US). Panel session to follow joined by Deema Kingsmill-Moore, Communications and Community Engagement Director MEA, Marriott International and Mazen Nahawi , CEO, CARMA. Moderated by Roger Bolton, President of the Arthur W. Page Society. A Seat at the Table: The Power of Communication Leaders: Panel session with Amina Taher, VP Corporate Affairs, Etihad Aviation Group, Jorge Camara, Deputy CEO, UAE World Energy Congress, and Farah Al Alami, Chief Marketing and Communications Officer, United Eastern Medical Services. Moderated by Fahad Al Qahtani, Chief Executive Officer at The Corporate Office. Power of Brands: How the Brand Defines Communications: Case study presentations with Mohammed AlSiddiq, Head of Digital Communications, Mubadala. Panel session to follow, joined by Umayma Abubakar, Head of Internal Corporate Relations, Mubadala and Danny Rogers, Editor-in-Chief, PRWeek. Moderated by Jonty Summers, Managing Director, Hanover ME. The 2018 MPRA Leadership Majlis was supported by corporate and agency partners including, The National Media Council, Jumeirah Group, Mubadala, Four Communications Group, Etihad Airways, PRWeek, Arthur W. Page Society and SOCIALEYEZ.